For many, the commute is the worst part of any day. Sitting in traffic for hours on a drive that should only take 30 minutes, all while hoping a good song comes on the radio. Now, imagine spending your entire day in the car, driving all around the city. To some, this is a nightmare, but at Food & Friends, it’s what our delivery drivers do, Monday through Saturday, 52 weeks a year. Kenni Wall, our Delivery Coordinator, has done this for over 10 years and is just as passionate about his work today as he was on his first day. Kenni repeatedly goes above and beyond in his work by volunteering to help with fundraising events after a long day on the road, obeying traffic laws, and picking up extra delivery stops to ensure new clients start receiving meals right away. Five days a week, Kenni drives more than 700 miles throughout DC, MD, and VA delivering meals to the most vulnerable members of our community. 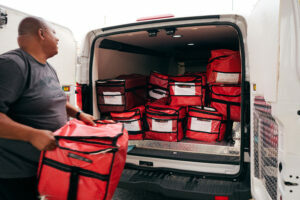 He brings meals to people who are going through chemotherapy and are too weak to prepare meals for themselves and their loved ones, and to people who are experiencing side effects from their HIV medications. It is not an easy task spending this much time alone on the road and witnessing, first-hand, the struggles that our clients endure. But for Kenni, it’s the clients that keep him motivated. “When you know someone [needs the food], appreciates it, and is happy to see you, that is what keeps me motivated,” said Kenni. Kenni has seen a lot and has positively impacted the lives of many in our community. A memory that stands out to him is from this last winter. It was a harsh, cold winter and our clients were hit harder than many in the community. One day, along with the meals, Kenni was delivering donated poinsettias. “I remember delivering to a client who lives in Calvert County, Maryland. When I arrived with the flowers she started crying – she loves having fresh flowers in her home and appreciated the gesture,” says Kenni. Our clients connect with our drivers as much as our drivers connect with the clients. We receive calls from clients every day just to say how much they love our delivery drivers. What makes our drivers so special? Compassion. “You need compassion to look someone in the eye, know they are hurting, and ask ‘how are you feeling?’ and to spare a few minutes of your time to speak with them. That takes compassion and our delivery drivers have that,” said Kenni. There is no denying that days at Food & Friends can be tough – there are a lot of people who need our help and conditions are not always on our side. Between inclement weather, extreme heat, road closings, and heavy traffic there are a lot of obstacles that can stand in the way of our drivers making successful deliveries. But our staff has a rapport that helps make the tough days a little easier. “Coming in every morning, seeing everyone laughing and joking is my favorite part about working at Food & Friends. When you come in you know that you are going to have a hard day to tackle and connecting with everyone before heading out on to the road prepares you to tackle those challenges,” said Kenni. Kenni takes great pride in the work he does every day for Food & Friends. Kenni was raised learning that if you can do anything to help someone less fortunate than yourself you are obligated to do so. This is evident in his tremendous work ethic and good spirit. We are happy to have him as part of the Food & Friends family and we know our clients feel the same way.